This table has the perfect accent of contemporary glam for your upcoming dinner party. 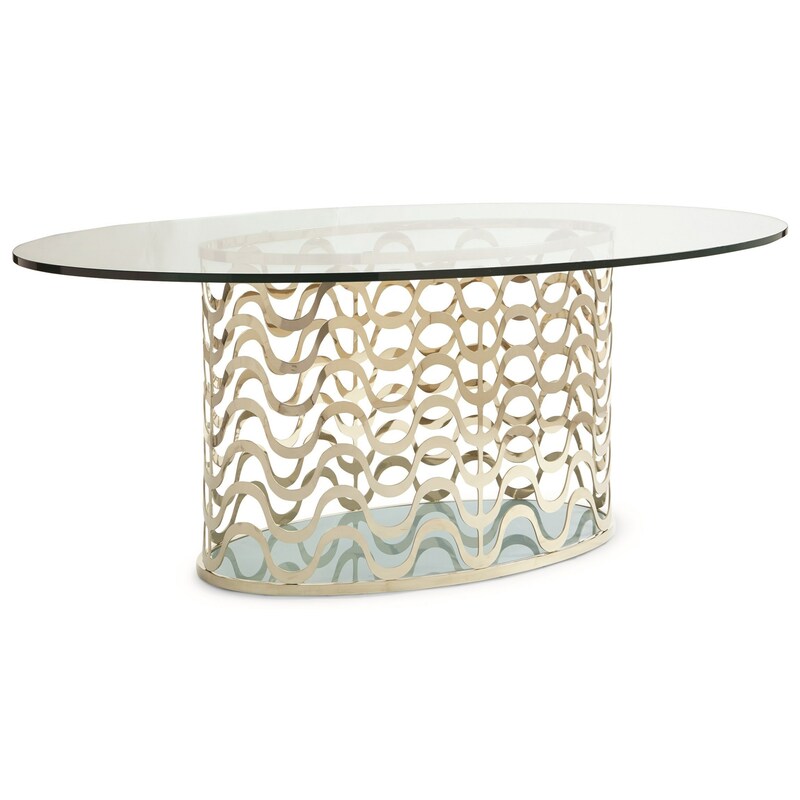 It features a glass table surface which sits atop a golden metal base constructed with undulating wave-like motifs. A surf-tinted glass insert at the table's bottom completes the ocean like affect. Floor to Apron: 28.5" Base: 42"W x 22.25"D x 28.5"H.
The Classic Contemporary Wavelength Dining Table by Caracole at C. S. Wo & Sons Hawaii in the Hawaii, Honolulu, Oahu, Hawaiian Islands, Waikiki, Diamond Head, East Honolulu area. Product availability may vary. Contact us for the most current availability on this product. Finish & Paint Options Varied finishes work together to create eclectic accents that combine deep dark tones with iridescent metallics. Handles & Hardware Jewelry inspired hardware pulls on case pieces. Case Detail Elegant leg styles throughout the collection including slender neo-classic designs and traditional paneled accents. Description: Top Product tops are comprised of wood and glass components. This classic contemporary collection is graceful and curvaceous. It combines highly tactile pieces with a multiplicity of textures and finishes for a group that offers a stately elegance. 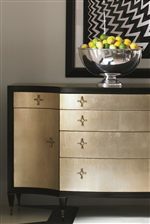 The collection mixes bright golden sheens with worn silvers, opaque glass surfaces and deep black finishes. While each storage and table piece has a traditional use as a console, nightstand or cabinet, the style of the items offers an intrinsic versatility, allowing them to flow into the design of nearly any room in your home. Use this group as a whole home collection or pick out your favorites for glamorous accent pieces. The Classic Contemporary collection is a great option if you are looking for Traditional Traditional furniture in the Hawaii, Honolulu, Oahu, Hawaiian Islands, Waikiki, Diamond Head, East Honolulu area. Browse other items in the Classic Contemporary collection from C. S. Wo & Sons Hawaii in the Hawaii, Honolulu, Oahu, Hawaiian Islands, Waikiki, Diamond Head, East Honolulu area.